WAILEA, MAUI, HAWAII (13 June 2018) Federal fishery managers, meeting today at the Wailea Beach Resort on Maui, Hawaii, have recommended measures to manage sea turtle interactions in the Hawaii shallow-set longline fishery targeting swordfish. Swordfish landed by the Hawaii shallow-set longline fishery at the Honolulu fish auction. The Western Pacific Regional Fishery Management Council recommended amending the Pelagic Fishery Ecosystem Plan (FEP) for the Western Pacific Region to establish a framework that consists of a) annual fleet-wide limits on the number of North Pacific loggerhead and leatherback interactions; once either of these interaction limits is reached, the fishery closes for the remainder of the year; and b) individual trip interaction limits for loggerhead and leatherback turtles; when a vessel has reached the limit on a trip, the vessel would be required to return to port and may resume shallow-setting upon providing the required 72-hour notice to National Marine Fisheries Service (NMFS) for observer placement. Besides these regulatory measures, the Council recommended that a sea turtle interaction avoidance pilot program be established utilizing an industry-led fleet communication system. It also requested that NMFS conduct further research on the sea turtle issue for this fishery, including research to minimize trailing gear on released loggerhead and leatherback turtles to further reduce post-hooking mortality rates. Regarding the American Samoa Large Vessel Prohibited Area (LVPA), the Council recommended a regulatory amendment to provide a four-year exemption for vessels permitted under the American Samoa longline limited entry program to fish within the LVPA seaward of 12 nautical miles (nm) around Tutuila, Manu‘a and Swains Islands and 2 nm around offshore banks identified by local fishermen and members of the public in American Samoa during a public meeting in Pago Pago. The Council reiterated its support of all fisheries occurring in American Samoa waters and within the US exclusive economic zone (EEZ). The Council further recommended annual monitoring of the American Samoa longline and troll catch rates, small vessel participation and local fisheries development initiatives. During Council discussion on the LVPA rule, Council Member Henry Sesepasara offered the Government of American Samoa’s position supporting the status quo, under which no exemption would be provided. The Council also recognized that alia fishermen who troll for yellowfin, skipjack and wahoo perceive that their fishing would be harmed if LVPA regulations are modified. However, available scientific information gathered when a similar modification was in effect in 2016 showed no adverse impacts to the catch rates of pelagic troll vessels, including alias. The 2016 LVPA rule led to disagreement within the American Samoa fishing community and is the subject of litigation. A 2017 federal court decision required the Council to consider and protect American Samoa cultural fishing (though the US government has noticed its appeal of this decision). To this end, NMFS conducted research on American Samoa cultural fishing practices and presented the results to the Council at its 172nd meeting in March 2018. The research indicates that all fishing in American Samoa has cultural importance, whether commercial longline, commercial alia vessels, troll or other fishing sectors because catch from all locally based fishing sectors flow into the American Samoa community for cultural purposes. In July and October 2017, the Council requested consultation with the Government of American Samoa on preserving and protecting cultural fishing. The Council also requested that the American Samoa Government forward a recommendation that would address its concerns of this action to the Council by May 30, 2018, in advance of its June meeting. The Council received a response from the American Samoa government in October 2017 that Sesepasara is the point of contact on cultural fishing; but it did not receive responses to the requests for a consultation on cultural fishing, nor did it receive a recommendation from the Government that would address its concerns about the proposed action. American Samoa Marine Conservation Plan: The Council concurred with the governor of American Samoa’s new three-year Conservation Plan (MCP) with the addition of a project to support research activities on pelagic fisheries. The research would include the collection of life history information, ecosystem indicators, economics and fishing communities, and fisheries interactions and management. The MCP describes how the local government would use funds received from Pacific Island Area fishery agreements or from fines and penalties as authorized by the Magnuson-Stevens Fishery Conservation and Management Act (MSA). Longline-caught bigeye tuna in the Western and Central Pacific Ocean (WCPO): The Council recommended that Amendment 7 of the Pelagic FEP and implementing regulations be modified to remove the requirements that a) catch or effort limits for longline-caught bigeye tuna in the WCPO be established for the US Pacific Territories prior to the establishment of the limits the Territories can allocate to US vessels permitted under the Hawaii longline limited entry program, and b) that annual catch and allocation limits must be established for longline-caught bigeye tuna in the US Pacific Territories by permitting the Council to recommend that NMFS promulgate multi-year catch/allocation limits. This action is intended to provide less disruption in the US bigeye longline fishery and reduce the administrative burden of specifying such limits annually. False killer whales: The Council recommended that NMFS review its serious injury determination policy and support additional research to obtain scientific information on species- specific post-hooking morality information to inform revision of the policy. NMFS currently classifies most false killer whale interactions in which the animal is released with trailing gear or a hook in its mouth as a serious injury, which is evaluated the same as a mortality. Seabirds: The Council will convene a workshop to review seabird mitigation requirements in the Hawaii longline fishery and the best available scientific information available while taking into account operational aspects of the fisheries, seasonality, the location of seabird interactions, alternative mitigation measures, and cost/benefit analyses. Eastern Pacific Ocean (EPO) skipjack tuna: The EPO skipjack is a major fishery but does not have a stock assessment. 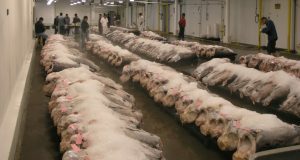 The Council will encourage the Inter-American Tropical Tuna Commission to support a formal assessment of the stock. Shark Species: The Council recommended that NMFS address the following data gaps and research needs for sharks that are listed under the ESA: a) Data on the capture of oceanic whitetip sharks in the non-longline pelagic fishery; b) Fishermen outreach to improve species identification of shark species to improve accurate catch data reporting; c) Identification of nursery ground habitat for ESA-listed scalloped hammerhead sharks, which are currently unknown in American Samoa, Guam and the Commonwealth of the Northern Mariana Islands (CNMI); and d) Improve shark data collection by the observer program shark. Protected Species Research: The Council recommended NMFS prioritize the protected species projects to include, among others, meta-analysis of sea turtle post-hooking mortality rate studies to inform future ESA consultations and evaluation of post-hooking mortality for marine mammals depending on amount of remaining gear. Mariana Archipelago Fisheries: The Council will communicate the fishermen’s concerns to the government of Guam regarding the ongoing issues with deployment of fish aggregation devices (FADs) in Guam and will ask the CNMI to provide the Council with the data and justification for the potential changes in minimum catch sizes being considered. Offshore Aquaculture: The Council recommended NMFS expedite its review process to ensure publication of the Draft Programmatic Environmental Impact Statement on an omnibus FEP amendment on aquaculture ahead of the Council’s October 2018 meeting in order for the Council take final action at its October meeting. Administrative Matters: The Council appointed the following members to its advisory bodies: Brett Schumacher to the Archipelagic Plan Team; Josh Lee to the Pelagic Plan Team; and Emily Crigtoler to the Pelagic Plan Team. Background information and the agenda for the Council meeting can be found at www.wpcouncil.org or by emailing info.wpcouncil@noaa.gov. Western Pacific Regional Fishery Management Council: Secretary of Commerce appointees from nominees selected by American Samoa, CNMI, Guam and Hawai`i governors: Edwin Ebisui Jr. (chair); Michael Duenas, Guam Fishermen’s Cooperative Association (Guam) (vice chair); John Gourley, Micronesian Environmental Services (CNMI) (vice chair); Dean Sensui, film producer (Hawai‘i) (vice chair); Archie Soliai, StarKist (American Samoa) (vice chair); Michael Goto, United Fishing Agency (Hawai‘i); Christinna Lutu-Sanchez, commercial fisherman (American Samoa). Designated state officials: Raymond Roberto, CNMI Department of Lands and Natural Resources; Suzanne Case, Hawai‘i Department of Land and Natural Resources; Matt Sablan, Guam Department of Agriculture; Henry Sesepasara, American Samoa Department of Marine & Wildlife Resources. Designated federal officials (voting): Michael Tosatto, NMFS Pacific Islands Regional Office. Designated federal officials (non-voting): Rear Adm. Brain Penoyer, USCG 14th District; Michael Brakke, US Department of State; Brian Peck, US Fish and Wildlife Service.